Solar energy, generated from locally-based solar panels will soon be powering the homes of United Power members. 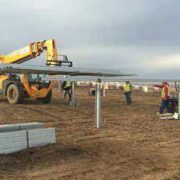 Early stages of construction on the 130-acre solar farm. Silicon Ranch will own and operate the facility and United Power will buy and distribute the electricity over a 20-year period.In late 2014, Brighton-based United Power initiated an effort to incorporate cost-effective local renewable energy sources to complement the power it purchased from its power supplier. 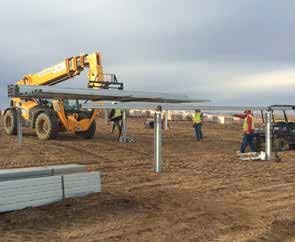 To help meet its renewable energy goals, United Power partnered with Silicon Ranch Corporation, one of the nation’s leading developers, owners and operators of solar energy facilities. Through that partnership, the local electric cooperative will buy the electricity generation by the 13-megawatt solar farm 3 miles east of downtown Fort Lupton. Once completed this spring, the 130-acre solar farm will generate 34.2 million kilowatt-hours of electricity per year from approximately 160,000 solar panels – enough to power 2,500 households.